1949 Simplicity #2883 vintage sewing pattern, misses' one-piece dress, plus size 18. The sleeveless bodice, fitted with darts, has a deep square neckline in front and back. A slide fastener closing in the back bodice ontinues into the three-gored skirt. A purchased belt may be worn. 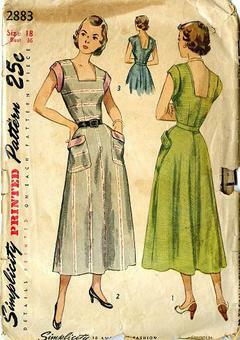 Large flap-trimmed patch pockets may accent the skirt, and cuffs trim the armhole edges.